I'm sure you've all seen the new(ish) wave of mascaras the ball type brush heads. I was really curious about how they'd perform so I purchased the Givenchy one a while ago. I didn't love it at first because it took me a while to get the hang of it but once I did, I was obsessed with it! When I saw the Loreal version I decided to pick it up too because I wanted to see if a drug store brand could pull off what Givenchy had. Packaging wise, there's just no comparing Givenchy to Loreal. Givenchy's is so sleek and compact and beautiful to look at while Loreal's is... well, a bit tacky in my opinion with its bright red telescope type design. I try not to judge a book by it's cover or a makeup product by it's packaging though so I held my judgment. The Givenchy looks a lot smaller but despite its size, it contains a pretty similar amount of product as the Loreal version at .24oz versus .27oz of product in the Loreal. The length of the wands is really different with the Loreal wand standing at almost double the length of the Givenchy mascara. I found this to be a bit of a problem at first since I prefer a shorter handle for a small brush head but I think you learn to control the Loreal wand after a few uses. I still think the shorter handle is much better for controlling application to the bottom and inner and outer corner lashes though. 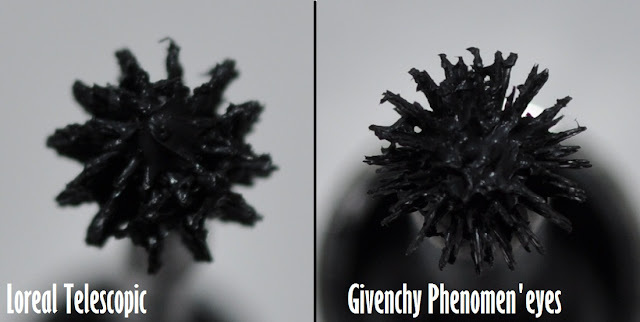 The brush heads themselves are quite different with the Givency (on the left) resembling a ball shape whereas the Loreal has more of an oval shape. At first I was a Givenchy girl all the way but after a few goes with the Loreal mascara, I have to say that my loyalty may be turning. That's mainly because the Loreal mascara seems to give a smoother look to the lashes, probably due to the fact that the bristles form a more uniform shape. The Givenchy on the other hand seems to excel more at seperation since it has so many more bristles. Both mascaras do a pretty good job at lengthening the lashes but I feel like the Loreal helps more with volume. I think the way the two mascaras apply is really most noticeable with 2 or more coats. The Givenchy gets a bit spidery looking while the Loreal stays quite smooth. I still like and use both mascaras and I prefer the Givenchy for my bottom lashes but I have to say that I'd probably recommend the Loreal one because of the huge difference in the prices. The Givenchy mascara sells for $29.50 US and the Loreal sells for $9.49 US. If you feel like splurging and want to try the original then go for the Givenchy but you'll still get a great mascara even if you decide to go for the budget Loreal version. Have you tried either of these mascaras? What are your thoughts? Also, do you think mascara's are worth splurging on? Let me know below! Ooh I've never tried these style of mascaras before, I'm scared I'd poke myself in the eye with it! But the L'Oreal version might be good to test the waters so to speak without spending much money and I agree with you that it seems to look much nicer on your lashes than the Givenchy version! a very nice post comparing both mascaras.I have tried other mascaras from L'Oreal but not telescopic,they are good.After reading your post I'll buy loreal telescopic as buying mascara was due n it suits my budget too!! I think Givenchy is slightly better, but for the price i would try loreal first then probably splurge if i need to. you look great with even just 1 coat! Megan: Lol I actually did poke myself in the eye once or twice while learning to use the Givenchy but now it's ok. I just wouldn't recommend using this in the car or when you're in a hurry! prettymom: Thanks! I think a sign of a good mascara is when you can just get away with one coat because I hate applying lots of layers!